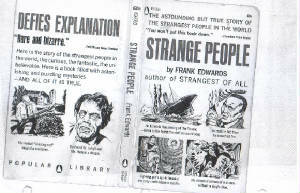 From the book: "Strange People"
Frank Edwards (1908-1967) wrote several books, one being "Strange People" published by Lyle Stewart, who died in June, of 2006. These books are out of print, but still can be found at certain onsite bookstores. Edwards (1961) describes me as being part of a 'small, select group of unusual persons known as a mathematical marvel'. He had describes the fact that I had been investigated by many psychologists and mathematicians, not with the intentions of exposing any possible trickery or fraud on my part, as I didn't put any of this on, but with a desire to learning how my 'abilities' worked and, if possible, how I was able to do these 'amazing' computations: Which none ever figured out and I'm still waiting for someone to help me understand it. He describes an 1940 election night when I was very young. I had been hired to stand before a 'battery of microphones and rattled off the incoming returns as fast as they were handed' to me (Edwards, 1961, p. 69). As Edwards described (1961) I would "instantly give the exact standing of any candidate on the board, including his current total, the percentage of votes counted at that point and the probable outcome of the contest on the basis of existing information". Needless to say, the paper that hired me that night had and advantage over their competitors that night: They, my competitors, 'were forced to rely on adding machines and ordinary calculators'(Edwards, 1961, p. 69). "He would instantly reply, giving the years, months, hours, minutes and seconds the candidate had lived to that moment. Even this was no real problem to a man who could multiply any seven digit number by any six-digit number in five seconds or less". Except taken from a book by Frank Edwards called: 'Strange People", published by Popular Library, (Strange people by Edwards, Frank, 1908-1967.New York, Lyle Stuart [c1961], pp. 69-70.